Alimoradi, M., Abdolahi, M., Aryan, L., Vazirijavid, R., Ajami, M. (2016). Cognitive Behavioral Therapy for Treatment of Adult Obesity. 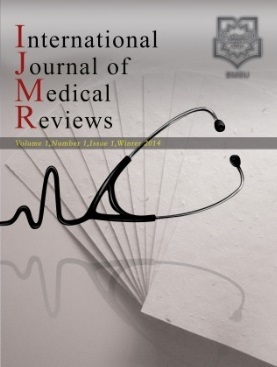 International Journal of Medical Reviews, 3(1), 371-379. Mohammad Alimoradi; Morteza Abdolahi; Leila Aryan; Roya Vazirijavid; Marjan Ajami. "Cognitive Behavioral Therapy for Treatment of Adult Obesity". International Journal of Medical Reviews, 3, 1, 2016, 371-379. Alimoradi, M., Abdolahi, M., Aryan, L., Vazirijavid, R., Ajami, M. (2016). 'Cognitive Behavioral Therapy for Treatment of Adult Obesity', International Journal of Medical Reviews, 3(1), pp. 371-379. Alimoradi, M., Abdolahi, M., Aryan, L., Vazirijavid, R., Ajami, M. Cognitive Behavioral Therapy for Treatment of Adult Obesity. International Journal of Medical Reviews, 2016; 3(1): 371-379.
physical activity, diet and medication, as well as invasive surgery, have not been successful in treatment of obesity, and reduced weight in most cases returns and weight maintenance has not been stable. therapy/CBT , lifestyle, behavioral therapy and other related terms and text words to find articles in English between 1970 to 2015.
based on the cause and nature of obesity. This intervention is effective for treating obesity with a focus on sustainable change in lifestyle. Conclusions: In this review success in an intervention program for the treatment of adult obesity consists of CBT is explained and aimed to evaluate the effect of CBT on obesity treatment since 1970 to 2015. Bastien, M., Poirier, P., Lemieux, I., Despres, J. P. Overview of epidemiology and contribution of obesity to cardiovascular disease. Progress in cardiovascular diseases,2014: 56(4), 369-381. Brennan L., Walkley J., Fraser S. F., Greenway K. Motivational interviewing and cognitive behaviour therapy in the treatment of adolescent overweight and obesity: study design and methodology. Contemporary clinical trials.2008:29(3), 359-375. Fabricatore, A. N. Behavior therapy and cognitive-behavioral therapy of obesity: is there a difference?. Journal of the American Dietetic Association.2007:107(1), 92-99. Stuart R. B. A three-dimensional program for the treatment of obesity. Behaviour Research and Therapy.1971: 9(3), 177-186. Blundell J. E., Gillett A. Control of food intake in the obese. Obesity research.2001: 9(S11), 263S-270S. Byrne S. M., Cooper Z., Fairburn C. G. Psychological predictors of weight regain in obesity. Behavior Research and Therapy. 2004: 2, 1341-1356. Harris M., Bruner C. A comparison of a self-control and a contract procedure for weight control.w. Res. di Therapy St,1971: 347-354.
Cooper, Z., Fairburn, C. G. A new cognitive behavioural approach to the treatment of obesity. Behaviour research and therapy,2001: 39(5), 499-511. Painot, D., Jotterand, S., Kammer, A., Fossati, M., Golay, A. Simultaneous nutritional cognitive–behavioural therapy in obese patients. Patient education and counseling,2001: 42(1), 47-52. Jeffery, R. W., Wing, R. R., Stunkard, A. J. Behavioral treatment of obesity: The state of the art 1976. Behavior Therapy,1978: 9(2), 189-199. Penick, S. B., Filion, R., Fox, S., Stunkard, A. J. Behavior modification in the treatment of obesity. Psychosomatic Medicine,1971: 33(1), 49-56. Rapoport, L., Clark, M., Wardle, J. Evaluation of a modified cognitive-behavioural programme for weight management. International journal of obesity and related metabolic disorders: journal of the International Association for the Study of Obesity,2000: 24(12), 1726-1737. Jeffery R. W., Drewnowski A., Epstein L. H., Stunkard A. J., Wilson G. T., Wing R. R. Long-term maintenance of weight loss: Current Status. Health Psychology. 2000: 19, 5-16. Driessen,E., Hollon, S. D. Motivational Interviewing From a Cognitive Behavioral Perspective. Cognitive and Behavioral Practice,2011: 18, (1), 70-73. Abramson, E. E. A review of behavioral approaches to weight control. Behaviour Research and Therapy, 1973: 11(4), 547-556. Grinker J., Hirsch J. and Levin B. The affective responses of obese patients to weight reduction: a differentiation based on age at onset of obesity. Psychosom. Med.1973: 35, 57-63. Schachter S. Some extraordinary facts about obese humans and rats. Am. Psychol.1971: 26,129-144. Bellack, A. S. Behavior therapy for weight reduction. Addictive Behaviors,1975: 1(1), 73-82. Wollersheim, J. P. Follow-up of behavioral group therapy for obesity. Behavior Therapy,1977: 8(5), 996-998. Wilson, G. T., Brownell, K. D. Behavior therapy for obesity: An evaluation of treatment outcome. Advances in Behaviour Research and Therapy,1980: 3(2), 49-86. Kingsley, R. G., Wilson, G. T. Behavior therapy for obesity: a comparative investigation of long-term efficacy. Journal of consulting and clinical psychology,1977: 45(2), 288. Bennett, G. A. Cognitive-behavioural treatments for obesity. Journal of Psychosomatic research,1988: 32(6), 661-665. Wilson, G. T. Behavioral treatment of obesity: Thirty years and counting. Advances in Behaviour Research and Therapy,1994: 16(1), 31-75. Leibbrand, R., Fichter, M. M. Maintenance of weight loss after obesity treatment: is continuous support necessary?. Behaviour research and therapy,2002: 40(11), 1275-1289. Jepsen, R., Aadland, E., Robertson, L., Kolotkin, R. L., Andersen, J. R., Natvig, G. K. Physical Activity and Quality of Life in Severely Obese Adults during a Two-Year Lifestyle Intervention Programme. Journal of obesity, 2015: 314194, 11 pages. Marchesini, G., Natale, S., Chierici, S., Manini, R., Besteghi, L., Di Domizio, S., Melchionda, N. Effects of cognitive-behavioural therapy on health-related quality of life in obese subjects with and without binge eating disorder. International journal of obesity and related metabolic disorders: journal of the International Association for the Study of Obesity,2002: 26(9), 1261-1267. McHugh, R. K., Hearon, B. A., Otto, M. W. Cognitive Behavioral Therapy for Substance Use Disorders. Psychiatric Clinics of North America,2010: 33(3), 511-525. Melchionda, N., Besteghi, L., Di Domizio, S., Pasqui, F., Nuccitelli, C., Migliorini, S., Marchesini, G. Cognitive behavioural therapy for obesity: one-year follow-up in a clinical setting. Eating and Weight Disorders-Studies on Anorexia, Bulimia and Obesity,2003: 8(3), 188-193. Fossati, M., Amati, F., Painot, D., Reiner, M., Haenni, C., Golay, A. Cognitive-behavioral therapy with simultaneous nutritional and physical activity education in obese patients with binge eating disorder. Eating and Weight Disorders-Studies on Anorexia, Bulimia and Obesity,2004: 9(2), 134-138. Hayes, S. C. Acceptance and commitment therapy, relational frame theory, and the third wave of behavioral and cognitive therapies. Behavior therapy,2004: 35(4), 639-665. Shaw, K., O’Rourke, P., Del Mar, C., Kenardy, J. Psychological interventions for overweight or obesity (Review). Cochrane Database of Systematic Reviews, 2006. Carr, D., Friedman, M. A. Is obesity stigmatizing? Body weight, perceived discrimination, and psychological well-being in the United States. Journal of health and social behavior,2005: 46(3), 244-259. Wardle, J., Cooke, L. The impact of obesity on psychological well-being. Best Practice & Research Clinical Endocrinology & Metabolism,2005: 19(3), 421-440. Grilo, C. M., Masheb, R. M., White, M. A., Gueorguieva, R., Barnes, R. D., Walsh, B. T., Garcia, R. Treatment of binge eating disorder in racially and ethnically diverse obese patients in primary care: randomized placebo-controlled clinical trial of self-help and medication. Behaviour research and therapy,2014: 58, 1-9. Adachi, Y. Behavior therapy for obesity. Japan Medical Association Journal,2005: 48(11), 539. Mozaffarian, D., Afshin, A., Benowitz, N. L., Bittner, V., Daniels, S. R., Franch, H. A., Popkin, B. M. Population approaches to improve diet, physical activity, and smoking habits a scientific statement from the American Heart Association. Circulation,2012: 126(12), 1514-1563. Eichler, K., Zoller, M., Steurer, J., Bachmann, L. M. Cognitive-behavioural treatment for weight loss in primary care: a prospective study. Swiss medical weekly,2007: 137(35-36), 489-495. Booth, H. P., Prevost, T. A., Wright, A. J., Gulliford, M. C. Effectiveness of behavioural weight loss interventions delivered in a primary care setting: a systematic review and meta-analysis. Family practice,2014: 31(6), 643-653. Brennan, L., Walkley, J., Fraser, S. F., Greenway, K., Wilks, R. Motivational interviewing and cognitive behaviour therapy in the treatment of adolescent overweight and obesity: study design and methodology. Contemporary clinical trials,2008 29(3), 359-375. Kolasa KM. Strategies to enhance effectiveness of individual based nutrition communications. Eur J Clin Nutr 2005; (59)1: 24-30. Webber KH, Tate DF, Quintiliani LM. Motivational interviewing in internet groups: a pilot study for weight loss. J Am Diet Assoc 2008; 108 (6): 1029-1032. Di Marco ID, Klein DA, Clark VL, Wilson GT. The use of motivational interviewing techniques to enhance the efficacy of guided self-help behavioral weight loss treatment. Eat Behav 2009;10(2):134-6. Corbalán, M. D., Morales, E. M., Canteras, M., Espallardo, A., Hernández, T., Garaulet, M. Effectiveness of cognitive–behavioraltherapy based on the Mediterranean diet for the treatment of obesity. Nutrition,2009: 25(7), 861-869. Werrij, M. Q., Jansen, A., Mulkens, S., Elgersma, H. J., Ament, A. J., Hospers, H. J. Adding cognitive therapy to dietetic treatment is associated with less relapse in obesity. Journal of Psychosomatic Research,2009: 67(4), 315-324. Palmeira, A. L., Markland, D. A., Silva, M. N., Branco, T. L., Martins, S. C., Minderico, C. S., Teixeira, P. J. Reciprocal effects among changes in weight, body image, and other psychological factors during behavioral obesity treatment: a mediation analysis. International Journal of Behavioral Nutrition and Physical Activity,2009: 6(1), 9. Van der Merwe, M. T. Psychological correlates of obesity in women. International Journal of obesity,2007: 31, S14-S18. Forman, E. M., Butryn, M. L., Hoffman, K. L., Herbert, J. D. An open trial of an acceptance-based behavioral intervention for weight loss. Cognitive and Behavioral Practice,2009: 16(2), 223-235. Palmeira, A. L., Branco, T. L., Martins, S. C., Minderico, C. S., Silva, M. N., Vieira, P. N., Teixeira, P. J. Change in body image and psychological well-being during behavioral obesity treatment: Associations with weight loss and maintenance. Body Image,2010: 7(3), 187-193. Wadden, T. A., Webb, V. L., Moran, C. H., Bailer, B. A. Lifestyle modification for obesity new developments in diet, physical activity, and behavior therapy. Circulation,2012: 125(9), 1157-1170. Jacob, J. J., Isaac, R. Behavioral therapy for management of obesity. Indian journal of endocrinology and metabolism,2012: 16(1), 28. Nozaki, T., Sawamoto, R., Sudo, N. Cognitive behavioral therapy for obesity. Nihon rinsho. Japanese journal of clinical medicine,2013: 71(2), 329-334. Paul, L., van Rongen, S., van Hoeken, D., Deen, M., Klaassen, R., Biter, L. U., van der Heiden, C. Does cognitive behavioral therapy strengthen the effect of bariatric surgery for obesity? Design and methods of a randomized and controlled study. Contemporary clinical trials,2015: 42, 252-256. Pimenta, F., Leal, I., Maroco, J., Ramos, C. Brief cognitive-behavioral therapy for weight loss in midlife women: a controlled study with follow-up. International journal of women's health,2012: 4, 559. Annesi, J. J., Tennant, G. A. From Morbid Obesity to a Healthy Weight Using Cognitive-Behavioral Methods: A Woman's Three-Year Process With One and One-Half Years of Weight Maintenance. The Permanente Journal,2012: 16(4), 54. Lloyd-Richardson, E. E., Jelalian, E., Sato, A. F., Hart, C. N., Mehlenbeck, R., Wing, R. R. Two-year follow-up of an adolescent behavioral weight control intervention. Pediatrics,2012: 130(2), e281-e288. Lasikiewicz, N., Myrissa, K., Hoyland, A., Lawton, C. L. Psychological benefits of weight loss following behavioural and/or dietary weight loss interventions. A systematic research review. Appetite,2014: 72, 123-137. Kong, A., Tussing‐Humphreys, L. M., Odoms‐Young, A. M., Stolley, M. R., Fitzgibbon, M. L. Systematic review of behavioural interventions with culturally adapted strategies to improve diet and weight outcomes in African American women. Obesity Reviews,2014: 15(S4), 62-92. Forman, E. M., Butryn, M. L. A new look at the science of weight control: how acceptance and commitment strategies can address the challenge of self-regulation. Appetite,2015: 84, 171-180. Wilfley, D. E., Welch, R. R., Stein, R. I., Spurrell, E. B., Cohen, L. R., Saelens, B. E., Matt, G. E. A randomized comparison of group cognitive-behavioral therapy and group interpersonal psychotherapy for the treatment of overweight individuals with binge-eating disorder. Archives of general psychiatry,2002: 59(8), 713-721. Hayes, S. C., Levin, M. E., Plumb-Vilardaga, J., Villatte, J. L., Pistorello, J. Acceptance and commitment therapy and contextual behavioral science: Examining the progress of a distinctive model of behavioral and cognitive therapy. Behavior Therapy,2013: 44(2), 180-198.